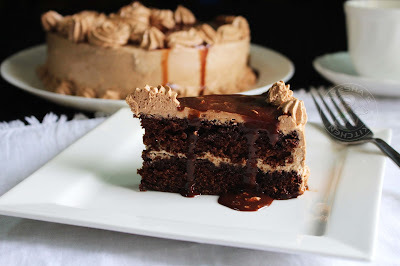 This rich chocolate coffee cake tastes as elegant as it sounds - Mocha Chocolate cake recipe. 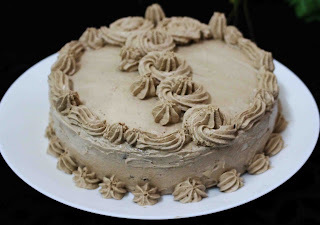 I have been wanting to make an easy mocha cake recipe for long. I think this is the best time to share this post as Christmas is around the corner. Though most of the people search for creative Christmas recipes, some will be googling for easy cake recipes to bake on Christmas eve. Hope this step by step explanation with related pictures will help you loads. Mocha, it means a flavoring made from chocolate and coffee. Mocha coffee is a very popular chocolate flavored coffee. Yes, this mocha chocolate cake is a rich dark chocolaty cake with an inviting coffee flavor. This coffee flavored cake is easy to prepare with a moist dense texture and has the perfect balance of sweetness. This mocha cake frosting is a simple Nutella whipped cream frosting only. And the Chocolate glaze or chocolate Ganache, which is the simple way to display a chocolaty cake i think. Chocolate ganache is used in many desserts for filling truffles, glazing cakes, mini tart glaze, cupcakes frosting like so. The consistency will vary depending upon the desserts. Hope you all give this chocolate cake recipe a try. 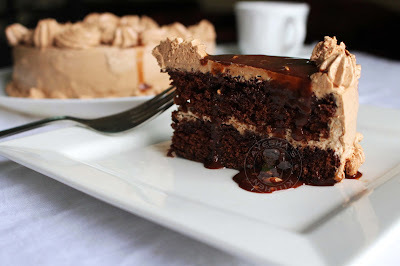 Here is the recipe showing how to make mocha coffee cake/chocolate layer cake recipe /coffee cake / simple chocolate cake /coffee chocolate cake/ganache recipe /Nutella frosting for a cake. (Heat the heavy cream in a sauce pan over medium heat. Bring just to boil and then pour over the Nutella (kept in a bowl). Let it cool and use. You can make it thin or thick consistency. I used to prepare the frosting of cakes first and is refrigerated until the cake is ready. This helps to get a stiffly whipped cream frosting. Keep the mixing bowl, wire whiskers in the freezer for 20 - 30 minutes before making the cream. It is optional only. Now let's start. Add whipping powder in the chilled bowl. To this add cold milk little by little.Whisk with electric whiskers until soft peaks are formed( it will take around 3 minutes). Whisk over a high speed, off the whisker. Again whisk over a medium speed, off the whisker. Like so, repeat until soft stiff peaks are formed. Finally, add Nutella and whisk. Do not ever whisk over a high speed continuously for 3 minutes, as it will change the color and results in the formation of butter. Keep it refrigerated until we prepare the cake. Preheat the oven to 180 degree C. Grease the pan with butter and dust with flour and tap out the excess flour. Set aside. Sift together All purpose flour, cocoa powder, salt, baking soda, baking powder. Set aside in a bowl. Now add eggs in a bowl, whisk it. To this, add sugar and whisk well until fluffy. Add oil and whisk well. Then add hot coffee and vanilla essence. Whisk again. Finally, add the sifted flour mixture little by little and fold them well. Do not use the whisker. Pour it into the prepared pan and bake in a preheated oven at 180 degree C for 30 - 35 minutes or until a tooth pick inserted comes out clean. Remove from the oven, let it cool completely before frosting the cake. Once the cake is cooled completely, level the top and sides of the cake. Then divide it into two thin cake layers. Set aside separately. Always keep the good cake layer on the top. Take a cake layer, drizzle some chocolate ganache or sugar syrup over it. This makes the cake more moist. Followed by some prepared whipped cream and cover it with the other cake layer. 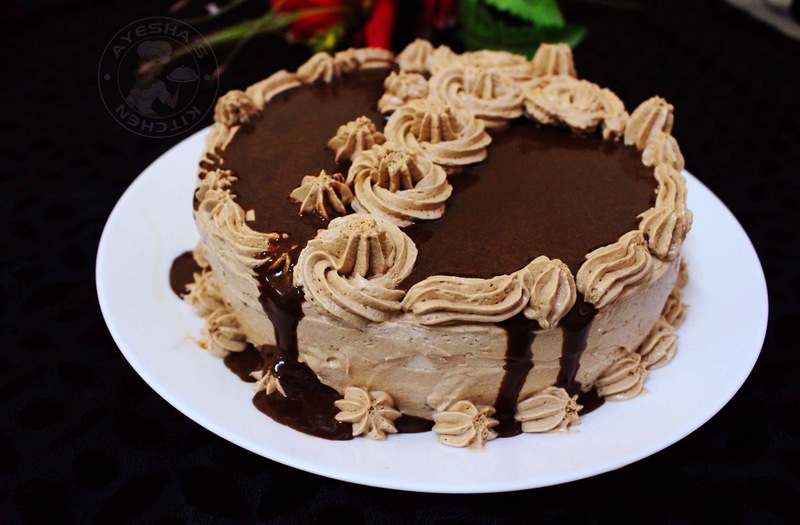 Drizzle some chocolate ganache or sugar syrup and spread the whipped cream all over the cake. Transfer this whipped cream into piping bags and make your own designs. Now refrigerate the cake before adding the Ganache. When done, pour the ganache on the top without disturbing the designs. Chill for few hours for a perfect slice. Enjoy this super moist chocolate coffee cake.